MILWAUKEE delivers ground-breaking innovation in tape measure durability with STUD Tape Measures. These Measuring Tapes are industry leaders in long-lasting durability. They feature EXO360 Blade Technology, protecting the blade from rip and wear damage with a high-density coating that wraps 360° around the blade, delivering the longest lasting blade. STUD Tape Measure blades are 10 times more abrasion resistant so the numbers won't fade. STUD heavy duty Tape Measures are fully encased in a reinforced frame and impact resistant overmold, allowing the Tapes to survive an 80 foot drop. The cutting-edge measuring tape blade technology, combined with a heavy-duty, fully reinforced frame, and up to 13 ft. tape standout makes our STUD Tape Measures the most durable retractable tape measures for all your jobsite needs. The DEWALT DWHT36107 25-ft. tape measure is ideal for measuring needs in plumbing, carpentry and many other applications. This tape features a fractional read blade for quick and easy measurements. The blade itself is covered with a protective Mylar coating for durability. The belt clip allows for easy attachment and storage. Kubota tape measure has Heavy duty aluminum exterior housing. Belt clip on back of case assures effortless accessibility. Measurements are highlighted with markings every, foot, meter and 16" stud center markings simplify framing jobs. Toggle lock is positioned for convenient operation and holds the blade securely in any position. 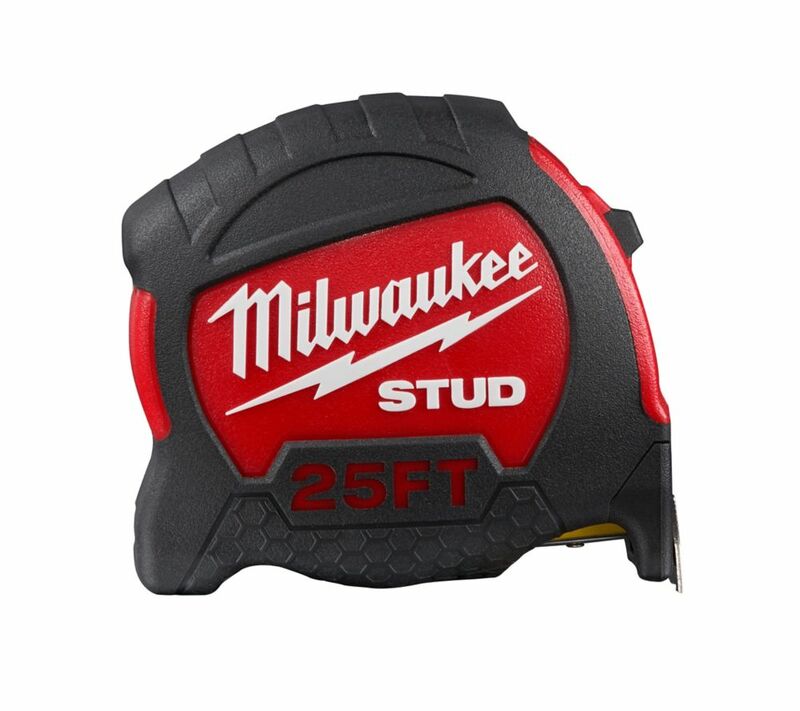 25 ft. STUD Tape Measure MILWAUKEE delivers ground-breaking innovation in tape measure durability with STUD Tape Measures. These Measuring Tapes are industry leaders in long-lasting durability. They feature EXO360 Blade Technology, protecting the blade from rip and wear damage with a high-density coating that wraps 360° around the blade, delivering the longest lasting blade. STUD Tape Measure blades are 10 times more abrasion resistant so the numbers won't fade. STUD heavy duty Tape Measures are fully encased in a reinforced frame and impact resistant overmold, allowing the Tapes to survive an 80 foot drop. The cutting-edge measuring tape blade technology, combined with a heavy-duty, fully reinforced frame, and up to 13 ft. tape standout makes our STUD Tape Measures the most durable retractable tape measures for all your jobsite needs.